"Reeves Hall, Roosevelt Hall and Memorial Hall, Chapman College, Orange"
Looking northeast at Reeves Hall, Roosevelt Hall and Memorial Hall, Chapman College, Orange, California, ca. 1978. 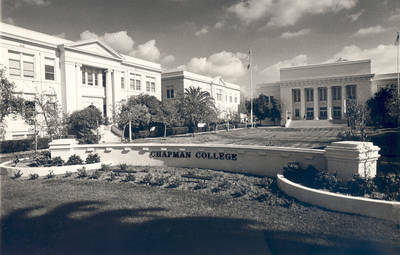 Low wall with Chapman College signage is in the foreground, with sunken lawn behind. Stamped on back: Bassett Phtography, 6216 S. Washington Ave., Whittier, CA. 90601. BW photograph; 6.25" x 9.75"